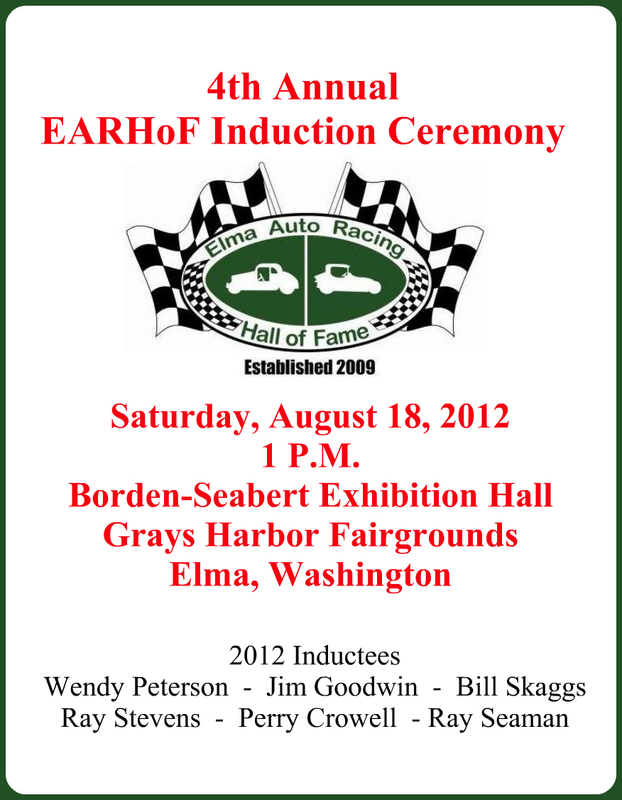 Joining 20 inductees currently in the Elma Auto Racing Hall of Fame, the six members of the class of 2012 will officially enter the EARHoF on Saturday, August 18th. Ray Stevens, Bill Skaggs, Jim Goodwin, Wendy Peterson, Perry Crowell, and Ray Seaman will join the EARHoF in a ceremony beginning at 1 P.M. in the Borden-Seabert Exhibition Hall at the Grays Harbor Fairgrounds in Elma, Washington. Profiles of each inductee will be presented and each Inductee or their representative will be given their Induction Award and Inductee Jacket. Each Inductee will have the opportunity to share with the gathering. Racing memorabilia will be on display. The ceremony will conclude with cake, coffee, and punch. Admission to the 4th Annual EARHoF Induction Ceremony is free. Donations to help defray the cost of honoring and preserving the auto racing history of Grays Harbor Raceway will gladly be accepted. The Elma Auto Racing Hall of Fame is a non-profit organization. Information about the EARHoF can be found at http://elmaautoracinghalloffame.webs.com. Hope to see a big turnout Saturday at 1 P.M., as we recognize 6 very deserving men with induction in the EARHoF. We will also be honoring Daryl Palmer with the Spoon Award for service to Elma auto racing in the past and Evergreen Fire (GH Raceway Safety Team) with the Brownfield Award for current service to Grays Harbor Raceway. Please help us honor these people with your attendance.